As an early adopter of the Appian cloud platform, we had some initial reservations on the value we were going to gain. 5 years later, we have certainly benefited from our use of this application and continue to reap the benefits. One of the strongest attributes is the cloud support team. They know the product well and have been very responsive to our needs. We view them more as partners than vendors and this is much appreciated. The licensing model options around dynamic workforces are an opportunity for improvement. Appian's cloud-based BPM suite yields tremendous return on investment. Their drag-and-drop approach to BPM, all done over the web with no downloads, results in lightning-fast model development. Seamless mobile forms capabilities without any custom code enable any user to get value out of delivered applications on all the major platforms that are popular today (IOS, Android, web). Finally, Appian's data interface redefines how end users collaborate and how enterprises gather information about their most important assets. Architech Solutions uses Appian Cloud to deliver enterprise applications to clients in both the commercial and federal markets. We recognize the Appian platform as leader in the BPMS market and we highly recommend it to any company looking to innovate and modernize their enterprise systems. Appian's capability as a modern BPM platform that supports Web, Mobile, Social and Cloud is well established. My comments here relate to the Cloud part of that package. Appian's SaaS offering has really helped us rollout rapid BPM solutions for several of our clients. The biggest impact is that it helps keep the BPM team's energy and focus on processes rather than infrastructure. Greatly minimizes additional burden on already over-stretched IT resources at client premises. The nitty gritties of Datasource configuration, Heap space allocation, Engine checkpointing & cleanup, Email polling setup etc etc is all abstracted away & what is left behind is the pure joy of processes in execution. Whats more, clients get automatic updates of latest product releases in a timely manner & the upgrades are seamless. With Appian Cloud, the BPM team is happy as their complete focus is maintained on process development & solutions, Developers are happy as they get full visibility into system logs for debugging (logs usually are to be requested from server teams), IT is happy as they have complete control of the company's precious data held within their premises while Appian Cloud references it via the Records interface (clear delineation between process and data, data can live within the company's servers and not be residing on the cloud) and most importantly Business user's are happy due to the rock solid stability and responsiveness of cloud hosted Appian instances. Quoting the words of one happy business user, "Runs as smooth as a canoe". Ultimately, it's a win-win for everyone. We use Appian BPM to create customized workflow and case management solutions for large healthcare companies. In the last 4.5 years we have deployed Appian BPM at 10+ of our customers and created 50+ applications used by 1000s of users. Appian BPM does what it says on the tin. It’s easy to learn, configure and maintain. In fact our Appian analysts team was never formally trained; they picked up the product whilst building solutions (although I do think it’s a good idea to get formally certified – you will be quicker off the blocks). Appian by far has the best process modeling capability. This combined with its easy to configure UI and integrated reporting capability significantly reduces development time. We have been able to configure most of our solutions in 10-12 weeks. These solutions would have taken at least 3x time with traditional software development approach. We particularly like the rules driven data access controls functionality, which is especially useful to meet complex patient data access scenarios. Healthcare delivery location is changing from hospitals to home. We have been able to tap into this opportunity by adding Appian mobile components to a number of our existing solutions. Furthermore new features like Datastore and Records have made the product a great choice of large-scale, data heavy applications. 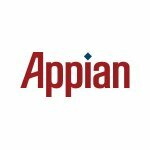 Apart from delivering a great product, Appian also provides exceptional customer service. They have an excellent support team that responds quickly and precisely. Overall, we are very satisfied with the choice we made. For corporations looking to quickly digitalize their business process without enormous capital investments, Appian is a great choice.